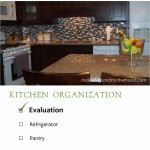 2013 brought a new adventure for me… creating and blogging here at Makeovers & Motherhood! What fun my first 5 months of blogging have been! Yes, there have been some late night sleep writing posts, but there has been even more fun sharing the activities and projects I love… crafting with my boys, organizing, and decorating! So as 2014 is now in full swing and I’m reminiscing over the past year, I can’t help but be awed by your response to Makeovers & Motherhood. Thank you for your support, for reading me, for linking your wonderful ideas here, and for sharing this blog with your friends! I appreciate and value each one of you and can’t wait to connect with you more in 2014! AND NOW… these top 13 posts are the posts you have read, shared, pinned, and interacted with the most! 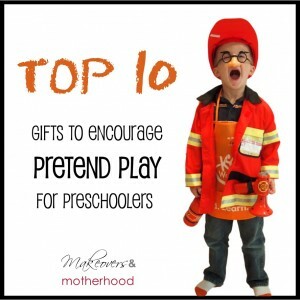 This was a fun one to write since pretend play can have so many creative avenues! Plus, I came away from writing this post with an education on the developmental benefits of pretend play! Just weeks after I started blogging, in an effort to get my two oldest boys ready for preschool, I started our August Alphabet Challenge. Each day we would work through a letter of the alphabet using activities, crafts, games, coloring/tracing pages, songs, rhymes, books, and even practicing words that started with that letter. 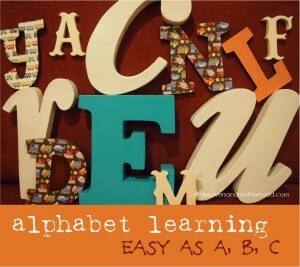 This post encompasses all 26 letters into one resource! 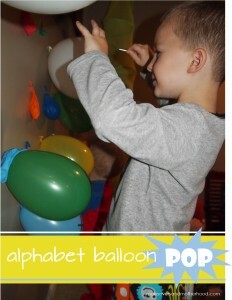 Based on a new learning app I was asked to review, this balloon pop made the app come to life and was a great hands-on learning activity that brought lots of squeals and fun for the whole family! As if writing a letter to Santa isn’t fun enough, this Dear Santa stationary with lined stationary, blank drawing sheets, or picture coloring helps little one of all ages create their own wish list! I like to craft with a purpose and what a better way to craft with my boys than in a way that will bless someone else! 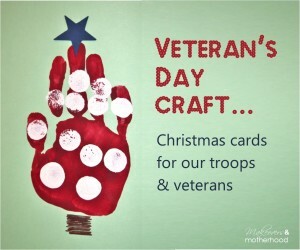 On Veteran’s Day we started making these patriotic handprint Christmas trees for the Red Cross’s Holiday Mail for Heroes project. It was a good way to talk to the boys about Veteran’s Day and the brave men and women who serve our country! Serving others is such a blessing to both the one receiving the service and the ones doing the service. 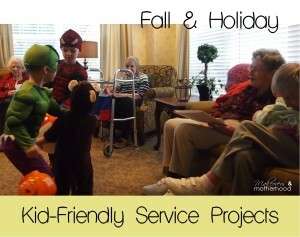 These kid-friendly service projects are simple and inexpensive ways that you can get your whole family out loving on others and teaching your children the joy of serving! 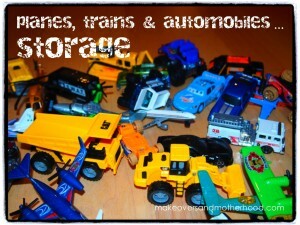 Having three boys also means having hundreds of little construction trucks, airplanes, trains, cars, and firetrucks! This cute, simple new storage method has been awesome! And even better… it was upcycle project! 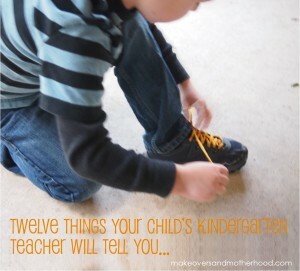 With my oldest going into Kindergarten next fall, I was so thrilled when a friend of mine (who is also a great writer and retired Kindgergarten teacher) shared the most needed things your child should know before starting Kindgergarten! And apparently, you were all thrilled too! I now feel like I can better prepare him and help make the start to his school years more successful. 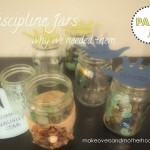 Making the jars is as fun as playing with them later! 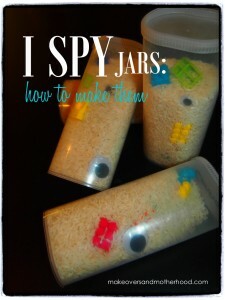 These I SPY jars are a great quiet time activity and for keeping in the car! And… it’s another upcycle project! Have the whole family go on a scavenger hunt for the items to include before the crafting even begins! Cheap + fun+ hours of quiet entertainment = a great project! 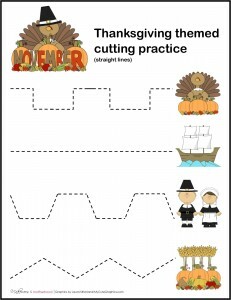 Your kids will gobble up the fun these cutting sheets will bring as they work on their fine motor skills! And, you can learn more on how proper scissor cutting skills benefit your child’s writing skills! 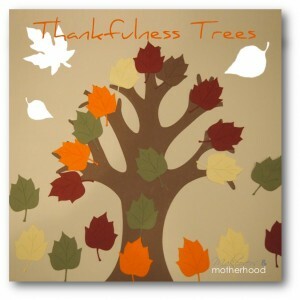 Count your blessings daily during the month of November with this beautiful tree! It is a great way to teach your children gratitude. 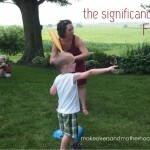 Hearing my boys’ and my husband’s responses to what they are grateful for was like seeing the world through their eyes. Some items were cute and funny, some were sincere. I am thankful we did this activity so I could hear their hearts! Our family loves to spend time playing games together. 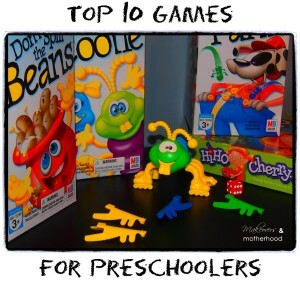 There are so many benefits to playing games: promotes quality family time, encourages fine motor development, aids in learning colors, numbers and math. So take some time out and just play! 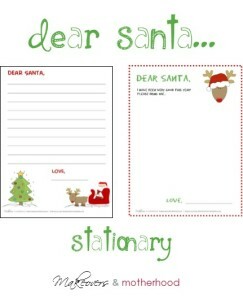 These cutting practice printables made the nice list for sure! After seeing how much everyone loved the Thanksgiving sheets, we just had to keep the fun going with these jolly Santa sheets! 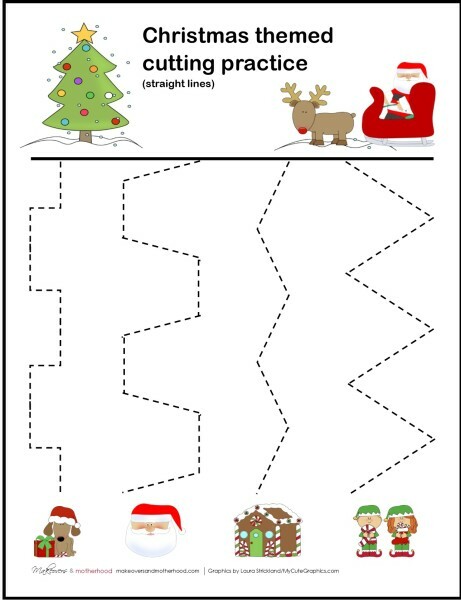 AND… since I now know how much your kiddos like scissor time, make sure to check back tomorrow for the new Winter Themed Cutting Practice sheets! Great round-up of your year! Thank you for sharing at Sharing Saturday! !